Celebrate Disney’s Cinderella, a modern classic that shines with beauty, imagination…and magic! Despite being mistreated by her stepmother (Cate Blanchett) and stepsisters, a spirited Ella (Lily James) resolves to take charge of her fate. Add a royal ball, a Fairy Godmother (Helena Bonham-Carter) and a glass slipper, and suddenly – magic becomes reality! Starring Cate Blanchett as Stepmother (The Curious Case of Benjamin Button, The Lord of the Rings: The Fellowship of the Ring), Lily James as Cinderella (TV’s “Downton Abbey”), Richard Madden (TV’s “Game of Thrones”) as Prince, Stellan Skarsgård (Marvel’s: The Avengers, Thor) as Grand Duke, Holliday Grainger (“Jane Eyre”) as Anastasia, Derek Jacobi (The King’s Speech, Underworld: Evolution) as King, and Helena Bonham Carter as Fairy Godmother (Alice in Wonderland, The King’s Speech), and directed by Kenneth Branagh (Jack Ryan: Shadow Recruit, Thor). Ella (Lily James) loves life. As a child she was happy and full of wonder. Ella has two spectacular parents who love her very much and have taught her to always be kind. Sadly her mother (Hayley Atwell) falls in and her father takes a new wife. Ella’s father (Ben Chaplin) takes care to make sure that she approves of his decision to seek happiness once more. 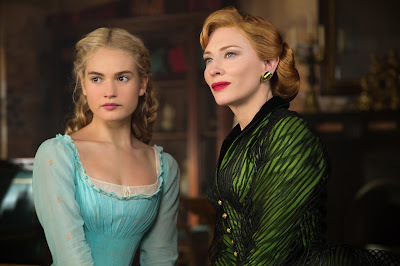 Ella welcomes Lady Tremaine (Cate Blanchett) and her two daughters Anastasia (Holliday Grainger) and Drisella (Sophie McShera) into her home. When Ella’s father leaves on a journey, the step sisters ask for material things as presents. Ella asks for the first branch to brush his sleeve. She wants him to carry the branch and think of her, but also return home swiftly. Sadly, a knock at the door reveals that her father has taken ill on the road and has died. He sent word along with the branch to his beloved daughter. Lady Tremaine immediately exclaims that they will be ruined financially. The household staff is dismissed and Ella becomes a servant in her own home. Ella gives up her room so that her sisters have more space and still finds happiness in the attic. But after sleeping by the embers of a fire to keep warm and cooking meals she only sees scraps off Ella is at her wits end. Her mother’s direction to have courage and be kind is hard to manage and she dashes off into the forest. 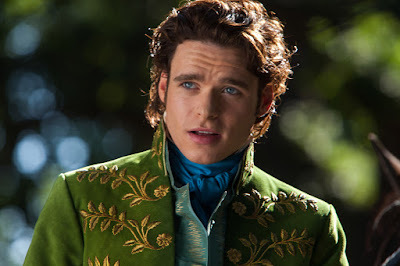 In the forest she meets a man named Kit (Richard Madden) with whom she finds an immediate connection. Ella’s kind soul comes through when Kit asks her about her situation and she responds that her “family” treats her as well as they are able. Kit tells Ella he is an apprentice which is technically true but she should have mentioned that he’s actually the Prince. Back at the palace, The Prince has been affected by his run in with the young woman and suggests that the upcoming ball is open to all. Ella is visited by a fairy godmother (Helena Bonham-Carter) who allows her to go to the ball in style. The fairy godmother does the work mending her dress and tops off the outfit with slippers that are in fact made of glass and are actually terribly comfortable. From here on out, the story stays true overall to the Disney classic you remember. Cinderella runs away and the Prince must find his true love with only a glass slipper to guide him. Making any tweaks to a story like Cinderella is certainly risky. If it weren’t for last year’s Maleficent, I would wonder how an animated film would translate into a live action feature. Branagh has undertaken a monumental task tackling friendly mice and pumpkin carriages, and would have certainly made enemies had he done a disservice to many people’s favorite Disney film. 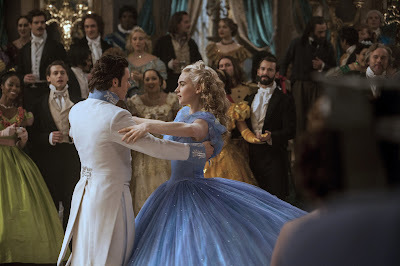 I like to think of this film as Cinderella re-imagined and expanded, not just brought to life. Everything new to this film is really more of an expansion of the original ideas and not what I’d call changes. I enjoyed getting to know Ella as a child, as well as her mother and father. The way her fairy godmother appears as a beggar, testing her kindness is also a nice touch. While Ella isn’t the kind of tough young lady shooting arrows or fighting bears, she is certainly tough. The fact that she sees so many hardships and remains true to her mother’s wishes is nice to see. Ella is a testament to her parents and teaches young girls (and boys) the importance of having a kind heart. The story is very well written and isn’t just a live action version of an animated film. It takes liberties when appropriate. It also has a lot of heart. The Prince’s relationship with his father proves to be touching and most of the fairy tale elements translate well to live action. Helena Bonham-Carter’s fairy godmother was the only thing that didn’t play well. I would have preferred a sweet and kind fairy godmother, with a personality closer to that of Ella’s mother. Instead Bonham-Carter’s portrayal was too over the top and comically odd for my taste. It’s a small thing, but I wish they had chosen a different actress or asked for a more subdued performance. 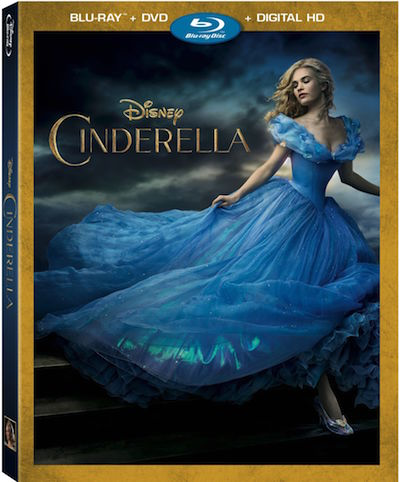 Cinderella is stunning on Blu-ray with a 1080p AVC-encoded transfer. The ball gowns pop and Ella’s ball gown is especially vibrant. Fine detail allows you to see each sparkle in her hair. Inside the family home, the textures and dust in Ella’s attic bedroom make you feel like you might cough on the particles in the air. The production design is excellent and combined with the crisp picture it would lead you to believe that not a single set piece was created. Skin tones are even and the forest and all environmental come to life in this exceptional Blu-ray release. 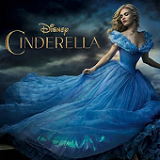 Cinderella’s DTS-HD Master Audio 7.1 surround track matches the video presentation fully. You’ll feel the weight of the horses as they gallop, and can hear the magic stirring as the fairy godmother makes her creations. Dialogue is clean and intelligible throughout the film and every sound has intention and purpose. The beautiful voice of Ella’s mother singing her to sleep will ring true through your living room. A Fairy Tale Comes to Life – Director Kenneth Branagh and primary cast and crew take us behind the scenes of Cinderella in this approximately nine minute featurette. Costume Test Fun – Three minutes of costume tests used to determine how the various fabrics would play on film. Staging the Ball – A look at costumes, set design and the intricate choreography of the ball. Frozen Fever – An animated short from the characters in Frozen. Ella's Furry Friends – Director Kenneth Branagh and the film’s animal trainers discuss the use of live animals in the film. Alternate Opening – Branagh provides an introduction for an alternate opening featuring Ella’s childhood. Director Kenneth Branagh has taken on a monumental task in bringing arguably one of Disney’s most beloved fairy tales to life. The film expands on Cinderella’s childhood and we get to know more about what her parents were like. This isn’t a scene by scene recreation of the classic animated film and is well worth owning in addition to the original. The Blu-ray’s audio and video qualities are top notch and there are a fun but short list of supplemental feature. I was pleasantly surprised by everything I encountered on the Blu-ray release which exceeded my expectations. I highly recommend purchasing Cinderella.